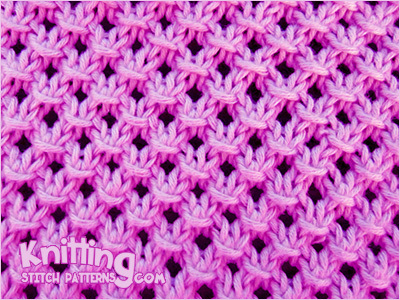 Video tutorial on how to knit the Knotted Openwork Stitch. Knitted in a multiple of 3 sts and 4-row repeat. Row 1 - WS: Purl all sts. Row 2: K2, * yo, k3 - then pass the first st over the second and third sts; repeat from * to last st, k1. Row 4: K1, * k3 - then pass the first st over the second and third sts, yo; repeat from * to last 2 sts, k2.